A Collection of all trophies. Customize many trophies with their own figure, base, insert, riser and columns. The red, white, and blue colors on these USA sport cheerleading medals are real eye catchers. 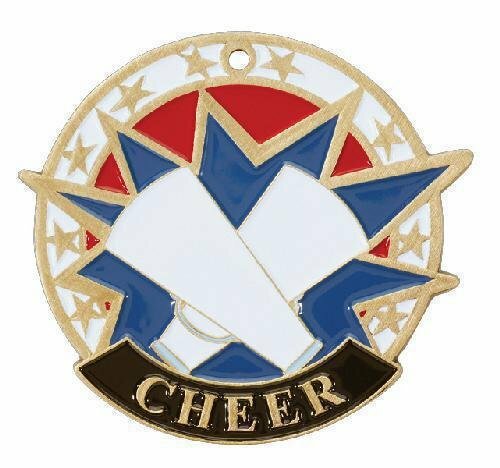 The medals have stars that go around the outer edge along with the word cheer printed along the bottom. Crossed white megaphones in the center finishes this stunning award. These medals are 2" in diameter and are available in gold, silver, or bronze. Plenty of room on the back for engraving. Just add a ribbon to complete this award. The red, white, and blue colors on these USA sport dance medals are real eye catchers. 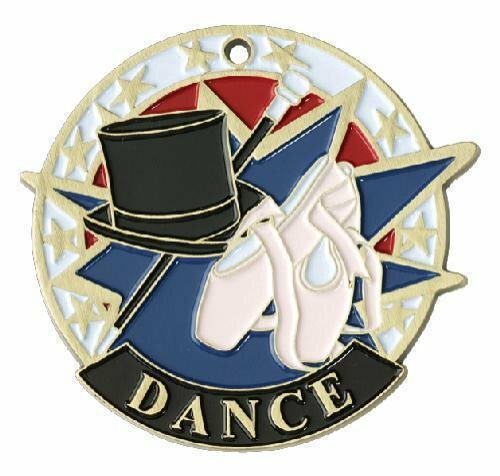 The medals have stars that go around the outer edge along with the word dance printed along the bottom. A top hat, dance cane, and ballet slippers finish this stunning award. These medals are 2" in diameter and are available in gold, silver, or bronze. Plenty of room on the back for engraving. Just add a ribbon to complete this award. The red, white, and blue colors on these USA sport football medals are real eye catchers. The medals have stars that go around the outer edge along with the word football printed along the bottom. 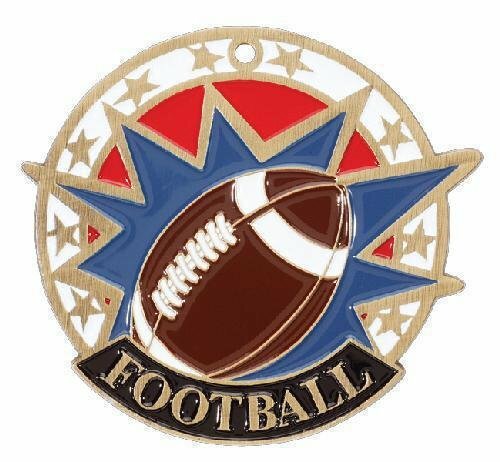 A full color football complete with white finger lacing finishes this stunning award. These medals are 2" in diameter and are available in gold, silver, or bronze. Plenty of room on the back for engraving. Just add a ribbon to complete this award. The red, white, and blue colors on these USA sport karate medals are real eye catchers. 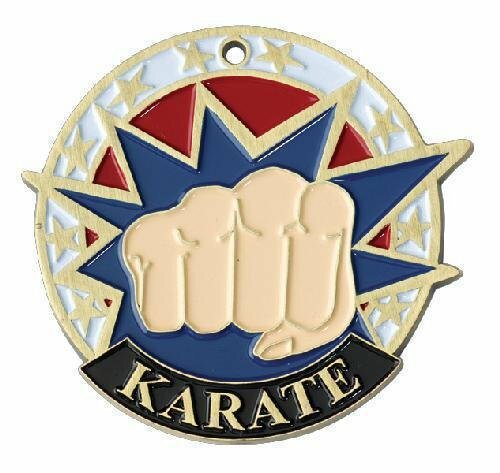 The medals have stars that go around the outer edge along with the word karate printed along the bottom. In the center is a clenched fist as if it were a karate punch that finishes this stunning award. These medals are 2" in diameter and are available in gold, silver, or bronze. Plenty of room on the back for engraving. Just add a ribbon to complete this award. The red, white, and blue colors on these USA sport knowledge medals are real eye catchers. 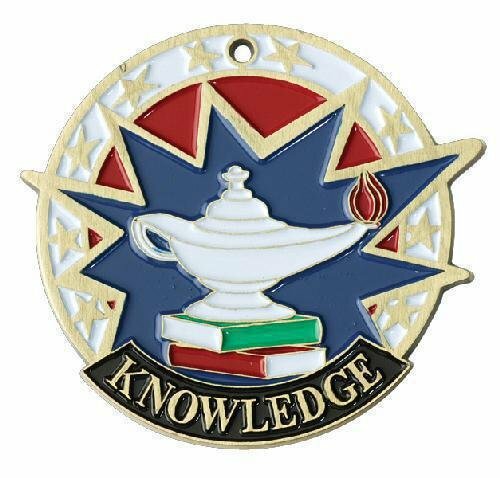 The medals have stars that go around the outer edge along with the word knowledge printed along the bottom. A lamp of knowledge sitting atop a stack of books finishes this stunning award. These medals are 2" in diameter and are available in gold, silver, or bronze. Plenty of room on the back for engraving. Just add a ribbon to complete this award. The red, white, and blue colors on these USA sport music medals are real eye catchers. 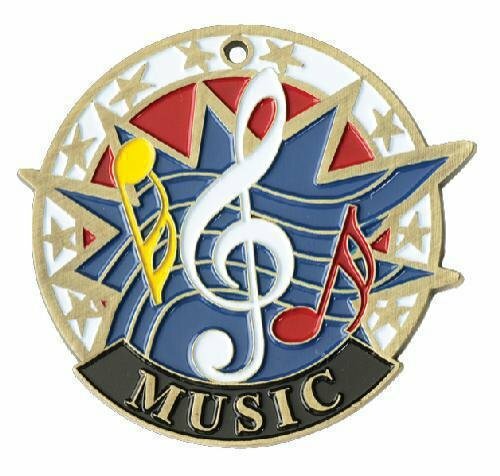 The medals have stars that go around the outer edge along with the word music printed along the bottom. Across the center are several floating music notes that finish this stunning award. These medals are 2" in diameter and are available in gold, silver, or bronze. Plenty of room on the back for engraving. Just add a ribbon to complete this award. The red, white, and blue colors on these USA sport soccer medals are real eye catchers. 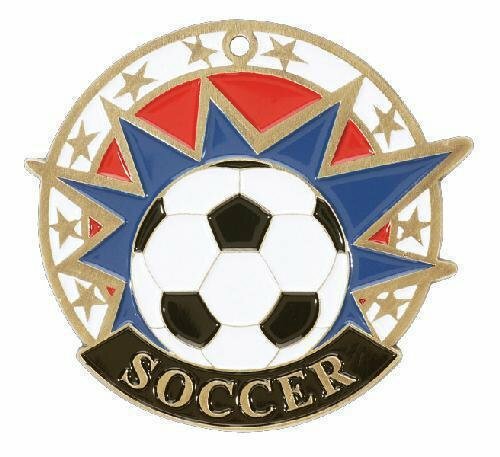 The medals have stars that go around the outer edge along with the word soccer printed along the bottom. A full color black and white paneled soccer ball in the center finishes this stunning award. These medals are 2" in diameter and are available in gold, silver, or bronze. Plenty of room on the back for engraving. Just add a ribbon to complete this award. The red, white, and blue colors on these USA sport softball medals are real eye catchers. 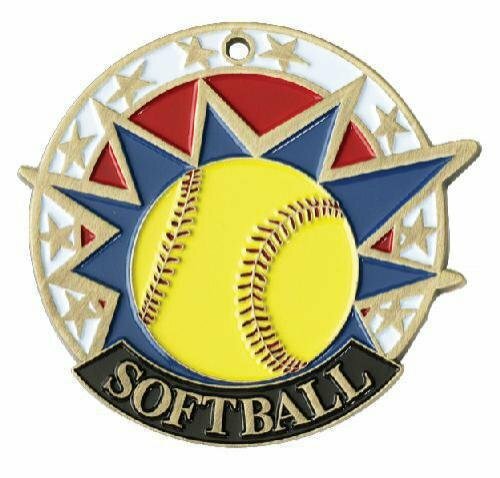 The medals have stars that go around the outer edge along with the word softball printed along the bottom. A full color yellow softball complete with red stitching finishes this stunning award. These medals are 2" in diameter and are available in gold, silver, or bronze. Plenty of room on the back for engraving. Just add a ribbon to complete this award. The red, white, and blue colors on these USA sport swimming medals are real eye catchers. The medals have stars that go around the outer edge along with the word swimming printed along the bottom. 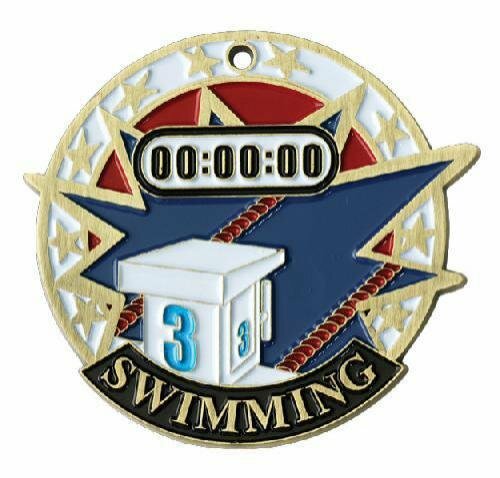 A digital stop watch, starting block, and a pool with lane markers finish this stunning award. These medals are 2" in diameter and are available in gold, silver, or bronze. Plenty of room on the back for engraving. Just add a ribbon to complete this award. The red, white, and blue colors on these USA sport track medals are real eye catchers. The medals have stars that go around the outer edge along with the word track printed along the bottom. 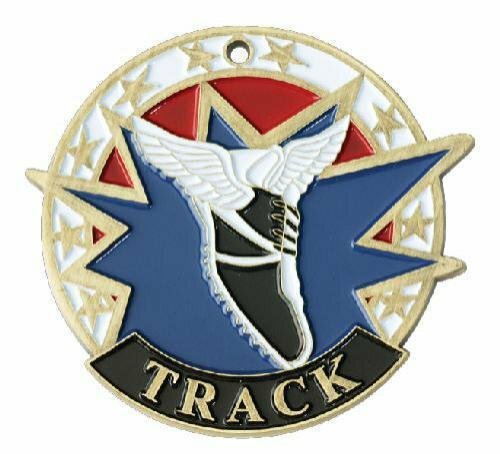 A winged track shoe in the center finishes this stunning award. These medals are 2" in diameter and are available in gold, silver, or bronze. Plenty of room on the back for engraving. Just add a ribbon to complete this award. Phone: 901-452-5393 Fax: 901-452-5490 Powered by BizWizard ShopKart by NetSoft Studio, LLC.